© 2002, © 2017 by Paul Freeman. Revised 5/29/17. 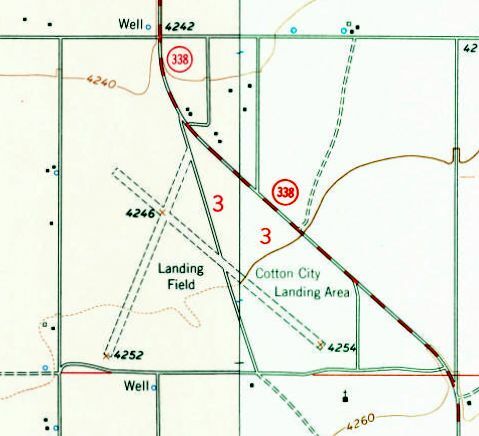 “Cotton City Landing Area”, as depicted on the 1964 USGS topo map. Sam Taylor reported in 2016 of the Cotton City Airfield, “My father departed from a small dirt strip some 55 years ago  & perished a few miles [away] in a crash. The earliest depiction which has been located of the Cotton City Landing Area was on the 1964 USGS topo map. 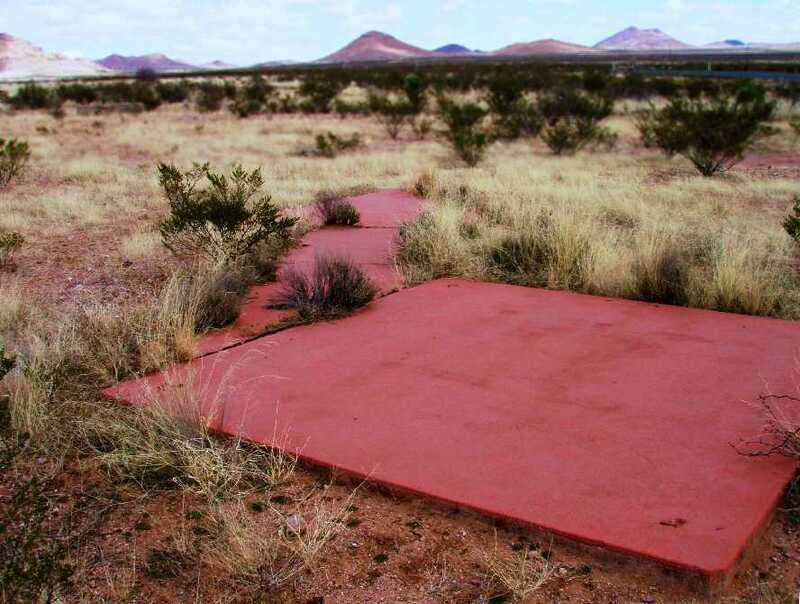 It depicted 2 unpaved runways in an X shape. There were no buildings depicted on the site. with 2 perpendicular unpaved runways oriented north/south & east/west. 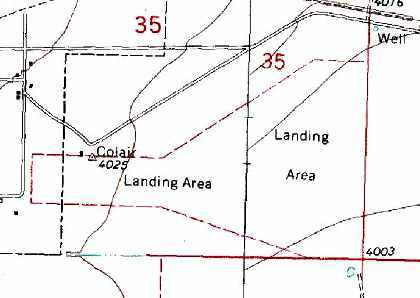 The Cotton City Landing Area was not depicted on the 1990-91 NM Aeronautical Chart (courtesy of Alex Hauzer). 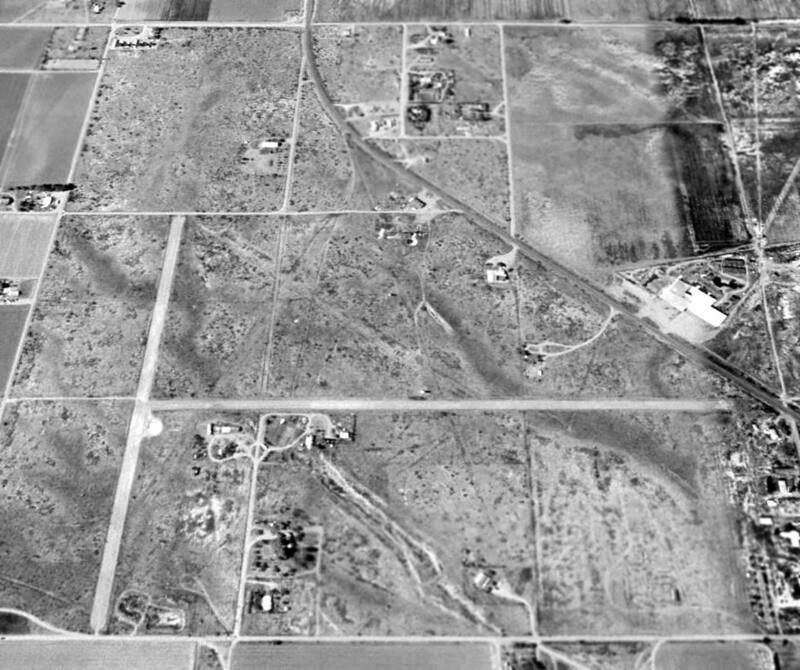 A 1998 USGS aerial view looking north depicted Cotton City as having 2 perpendicular unpaved runways oriented north/south & east/west. but according to my relatives no one else has used it in years. I have a brother who lives on the edge of the strip. In 2013 my brothers dragged both runways in anticipation of my landing there but it is now overgrown again. A 2014 aerial view looking north depicted the Cotton City runways as remaining recognizable but deteriorated. The site of Cotton City Landing Area is located south of the intersection of Route 338 & County Road 81. Thanks to Sam Taylor for pointing out this airfield. 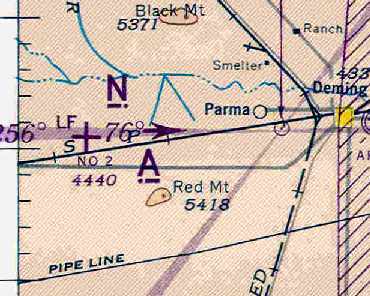 Turner Ridgeport Airport, as depicted on the 1984-85 NM Aeronautical Chart (courtesy of Alex Hauzer). According to a 1985 FAA Airport/Facility Directory entry, Turner Ridgeport Airport was established on 9/1/71. 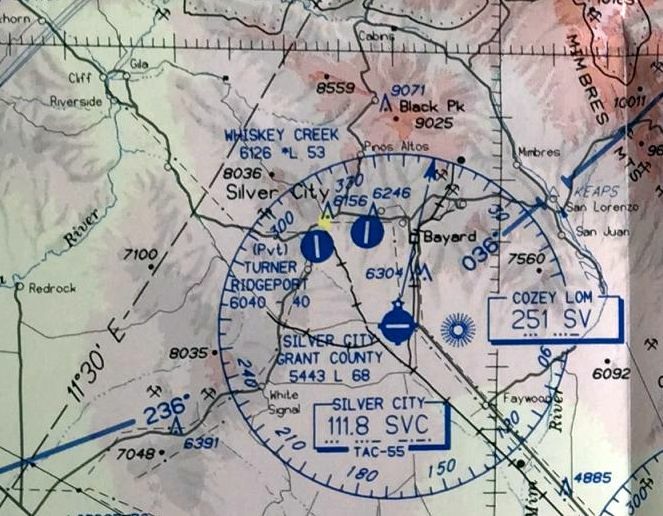 The earliest depiction which has been located of Turner Ridgeport Airport was on the 1984-85 NM Aeronautical Chart (courtesy of Alex Hauzer). It depicted Turner Ridgeport as having a 4,000' paved Runway 15/33 & a 2,400' gravel Runway 8/26. As of 1985, Turner Rudgeport was a private airfield, owned by Grant City Flying Service, and managed by William Turner. It had 2 runways: a 4,000' asphalt Runway 15/33 & a 2,400' soil Runway 8/26. The airport was said to have 2 based aircraft: 1 multi-engine aircraft & 1 ultra-light aircraft. was on the 1990-91 NM Aeronautical Chart (courtesy of Alex Hauzer). It depicted Turner Ridgeport as a private airfield having a single north/south 4,000' paved runway. 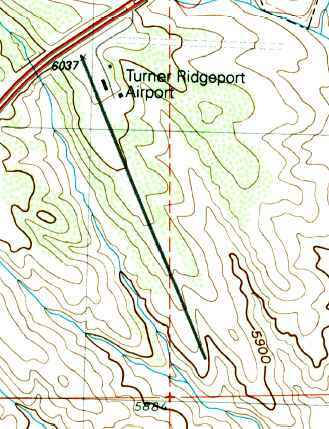 The 1992 USGS topo map depicted Turner Ridgeport Airport as having a single paved northwest/southeast runway, with 3 small buildings on the northeast side. 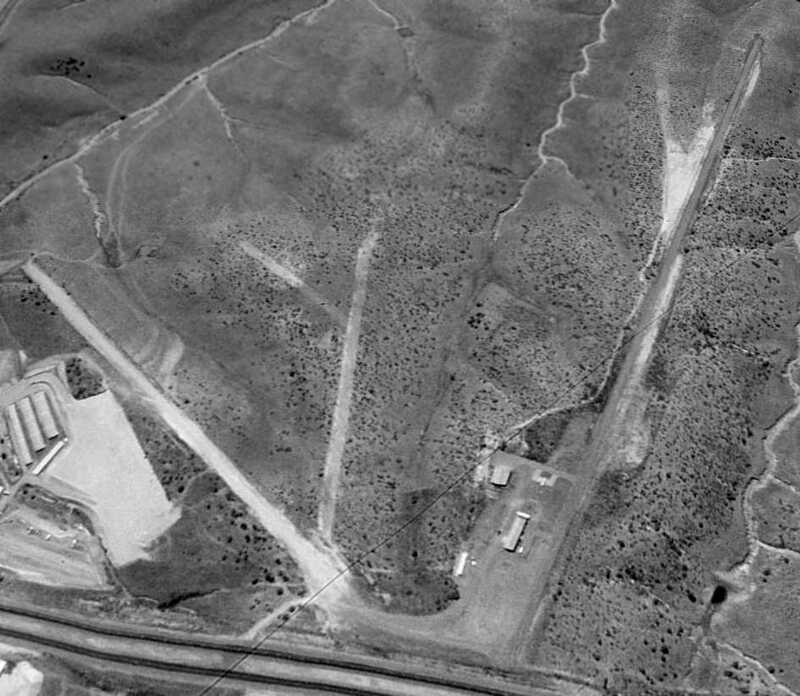 The earliest photo which has been located of Turner Ridgeport Airport was a 10/7/97 USGS aerial view looking southeast. It depicted Turner Ridgeport's single paved runway (on the right), with a ramp with a few small buildings on the north side (in the foreground). There were no aircraft visible, or any other sign of recent aviation usage. 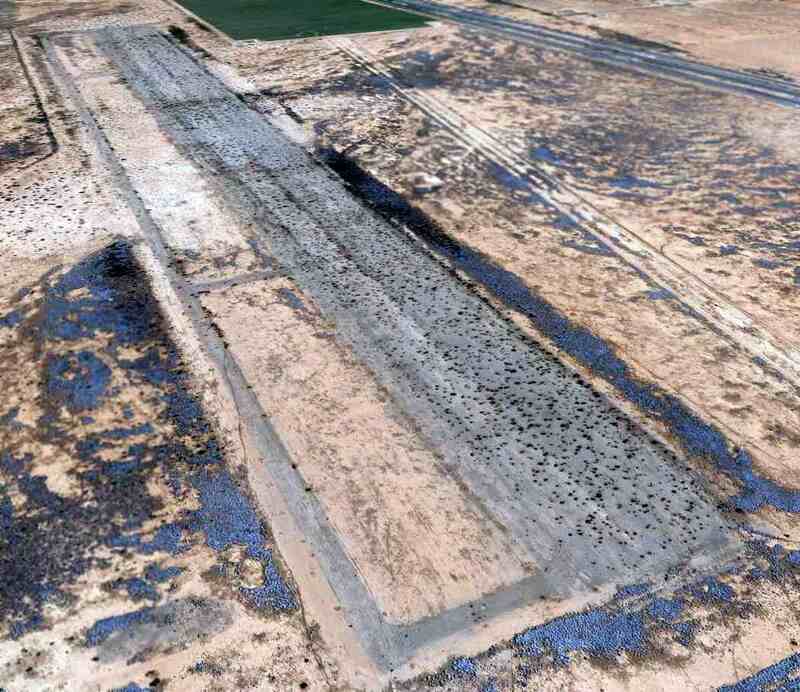 were these runways that predated the paved runway? A 7/25/11 aerial view looking southeast at Turner Ridgeport Airport showed it to remain intact, although evidently abandoned. 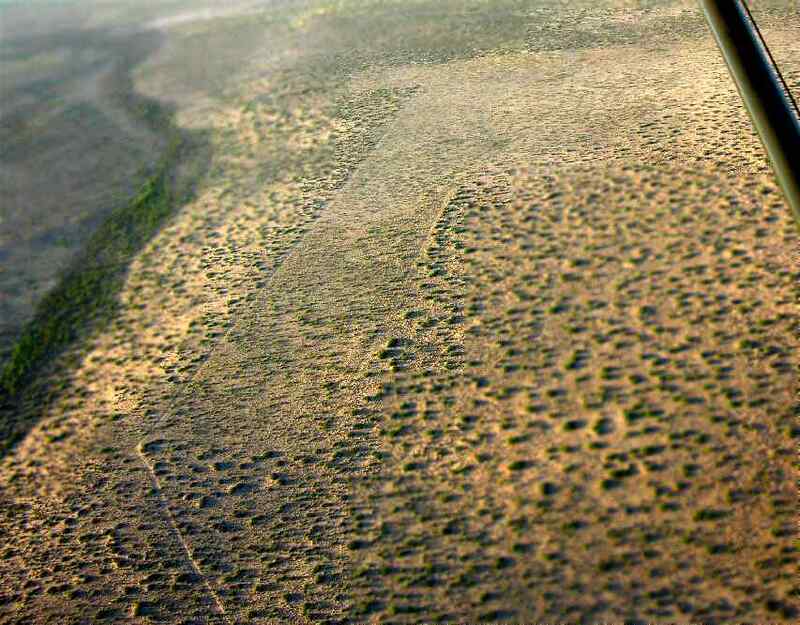 The remains of the other possible runways to the east also remained recognizable. The date of closure of Turner Ridgeport Airport has not been determined. It was depicted as an abandoned airfield on the 2012 Sectional Chart. It was presumably closed due to competition from the Whiskey Creek Airport, located only 5 miles to the east. The site of Turner Ridgeport Airport is located southwest of the intersection of Route 90 & Truck Bypass Road. 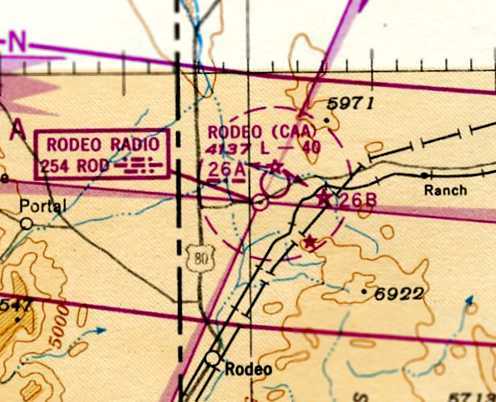 Rodeo Airport, as depicted on the September 1942 Douglas Sectional Chart (courtesy of Chris Kennedy). along commercial airways between major cities. The date of construction of the Rodeo Intermediate Field has not been determined. was its listing in the 1934 Department of Commerce Airway Bulletin (according to David Brooks). It described Rodeo Intermediate Field as the Department of Commerce's Site 57A. It described the field as having 2 dirt: 3,950' east/west & 3,140' north/south. along the San Diego – El Paso Airway. containing 2 runways: 3,950' east/west & 3,140' north/south. The field was said to have a rotating beacon, and boundary & approach lights. was on the September 1942 Douglas Sectional Chart (courtesy of Chris Kennedy). 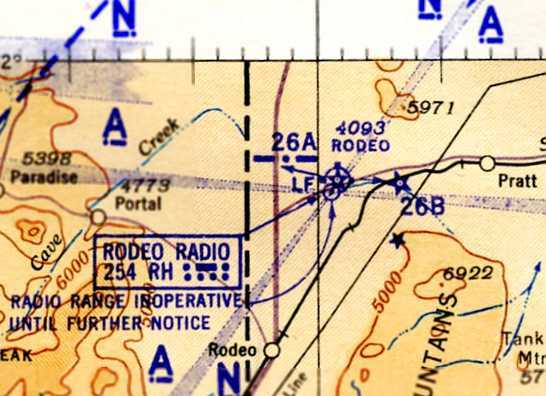 It depicted Rodeo as Site 26A. 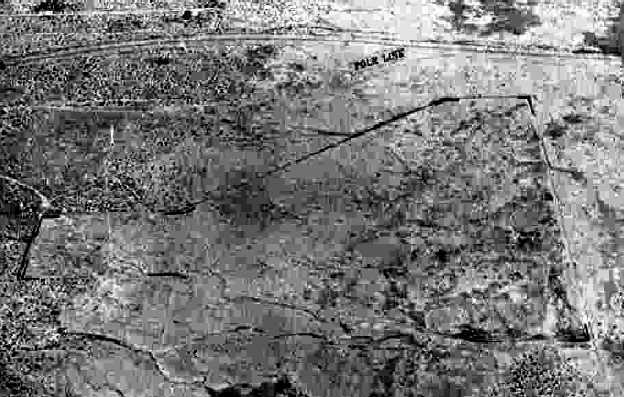 was a circa 1942-45 aerial view looking north from the 1945 AAF Airfield Directory (courtesy of Scott Murdock). 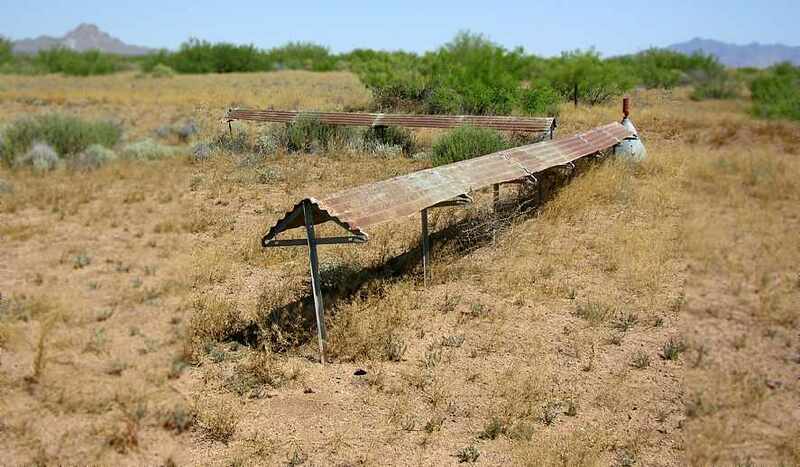 It depicted Rodeo Intermediate Field as an unpaved irregularly-shaped landing area. as a 140 acre L-shaped property field having 2 bare runways, measuring 3,950' east/west & 3,140' north/south. but was said to be illuminated with a rotating beacon, course lights, obstacle lights, boundary lights, and range lights. The airfield was described as being owned by the U.S. Government & the State of NM, and operated by the Civil Aeronautics Administration. 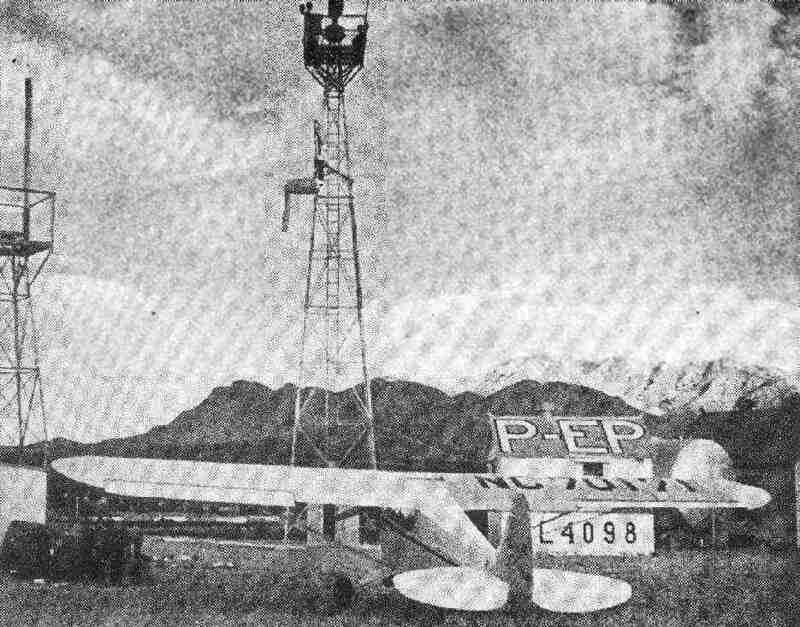 An undated photo of a Piper Cub in front of the Rodeo radio tower & shack, from a June 1947 Skyways Magazine article (courtesy of Jerry Sorrell). having a 4,000' unpaved runway. It also depicted the adjacent Rodeo Radio beacon. was on the 1953 Douglas Sectional Chart (according to David Brooks). 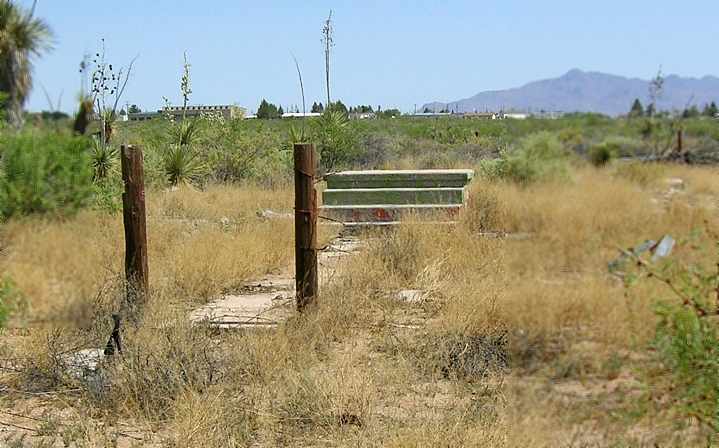 It depicted Rodeo as Site 26B, with 2 unpaved runways, the longest being 3,950'. as it was no longer depicted on the September 1954 Douglas Sectional Chart (according to Chris Kennedy). Intermediate Fields had largely become superfluous with advances in the range & reliability of commercial aircraft. 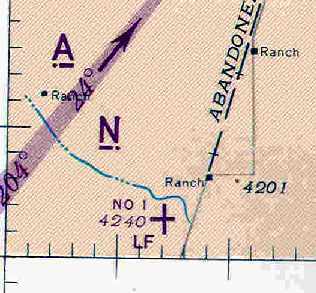 The last map depiction which has been located of the Rodeo Intermediate Field was on the 1955 USGS topo map. It labeled the airfield as “Rodeo (CAA)”. 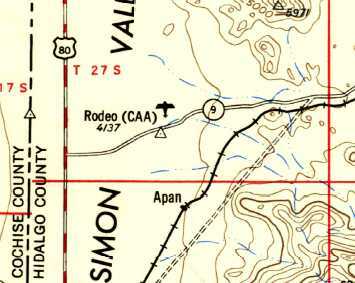 Nothing was depicted at the site of Rodeo Intermediate Field on the 1982 USGS topo map. 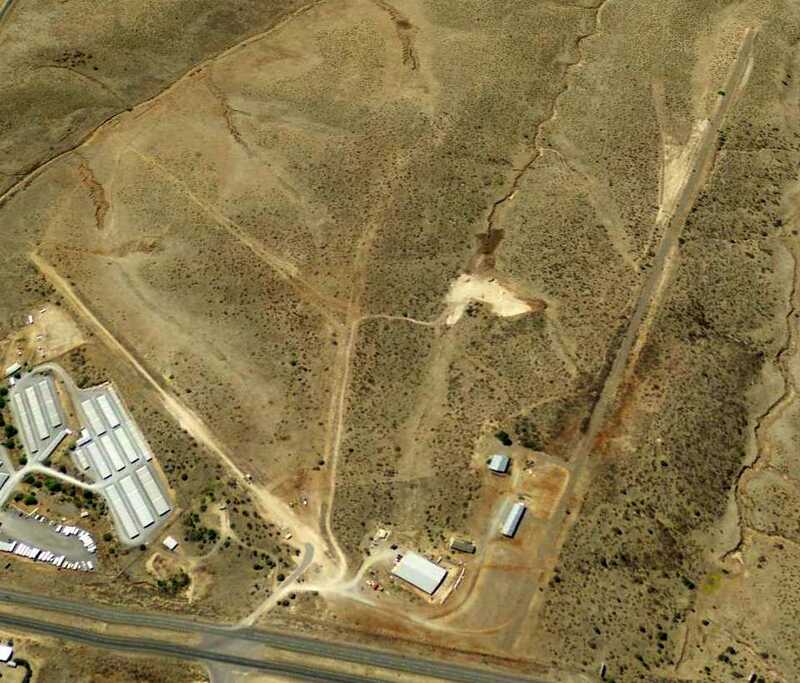 A 2006 aerial view still showed the recognizable outline of the 2 runways at the site of Rodeo Intermediate Field. A February 2007 aerial view by Bruce Thompson looking east at the arrow & building remains at the site of Rodeo Intermediate Field. A February 2007 photo by Bruce Thompson of Rodeo's former airmail route directional arrow. A February 2007 photo by Bruce Thompson of the water tank foundation at Rodeo. 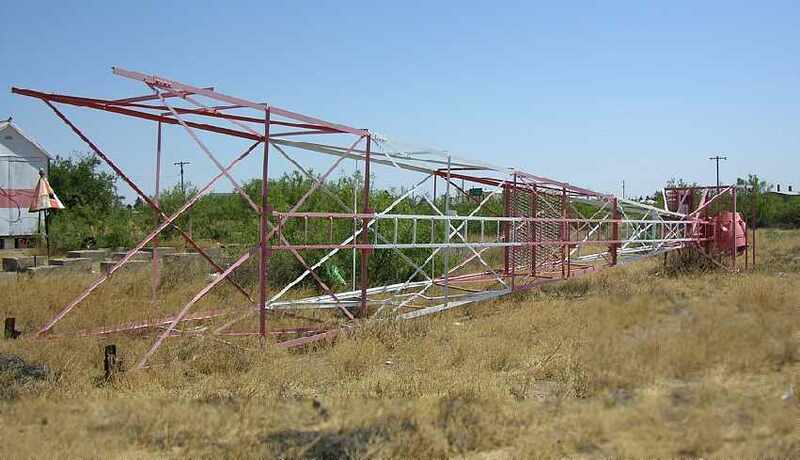 A 2010 photo by Bruce Thompson “of the old radio building from Rodeo Intermediate field. Apparently the building was moved into town after the airfield was shut down. It is now part of Rodeo Cottages. 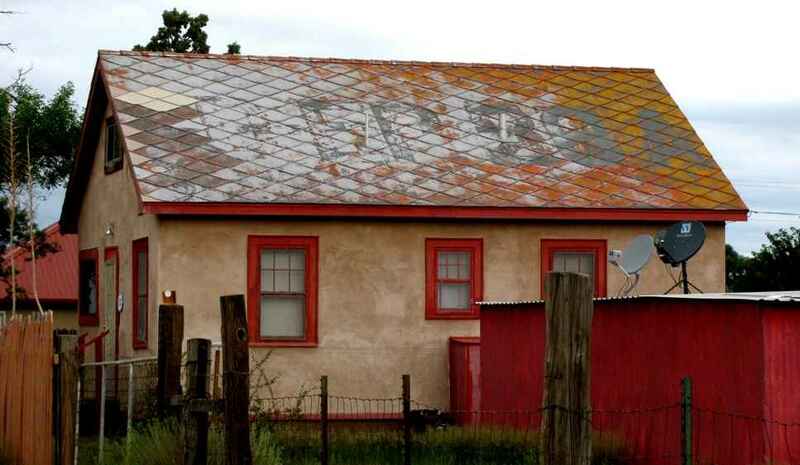 The airway designation is still visible on the roof on the backside of the building & it says 'Rodeo' on the front. Veronica Straus reported in 2011, “I own the Rodeo Cottages. The large cottage was the radio shack. and asked him to come & look at it before I put in a new floor & re-did the kitchen. He told me that he had stayed there as a young boy scout during a rain storm. They were camped on the airfield & the radio operator took pity on them & let them sleep inside the radio shack. A hutch is built into the wall in the kitchen & I didn't remove it. Junior says that the bedrooms had twin beds for the pilots & the hutch was always filled with coffee, peanut butter & bread. and in the middle of the room there was a 5'x7' square of brown linoleum with a lot of holes drilled through the floor. Junior said that that was where the massive radio was located. No PC's then. The site of Rodeo Intermediate Field is located northeast of the intersection of Route 9 & Route 80. According to the First Aero Squadron Foundation, “On 3/9/1916, the United States was invaded by forces under the command of the Mexican revolutionary Pancho Villa. Eighteen Americans were killed before the Villa rebels were turned back. to cross into Mexico to locate & destroy Villa & his fighting forces. Accompanying the US ground forces, which grew to almost 10,000 men, was a small detachment of US Army airplanes which were based at a landing field outside of Columbus. This deployment of the First Aero Squadron, flying Curtiss 'Jenny' biplanes, was the first use of US Army airplanes in a U.S. military campaign. in the 1920s & 1930s to serve as emergency landing fields along commercial airways between major cities. The date of construction of Columbus Airport has not been determined. was in the 1931 Descriptions of Airports & Landing Fields (according to David Brooks). Site 65 along the San Diego - El Paso Airway. It was said to have 2 sod runways: 3,610; east/west & 2,628' north/south. The field was said to have a rotating beacon, but to offer no services. was a 1/16/42 aerial view looking north from the 1945 AAF Airfield Directory (courtesy of Scott Murdock). It depicted Columbus Intermediate Field as an unpaved irregularly-shaped landing area. was on the January 1944 El Paso Sectional Chart (courtesy of Chris Kennedy). 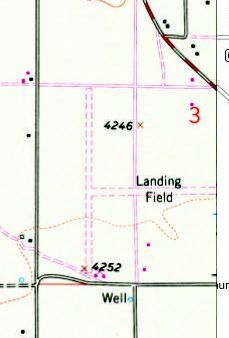 as the 1944 Sectional labeled it as Site 34.
as a 114 acre triangular property field having a bare all-way landing area, measuring 3,610' east/west & 2,610' north/south. but was said to be illuminated with a rotating beacon, course, obstacle, boundary, landing strip, and range lights. The airfield was described as being owned by private interests, and operated by the Civil Aeronautics Administration. Cy Martin recalled, “My family traveled that area with my dad when he was Assistant Airways Engineer back during WWII. The terminal building at Columbus was a communication & weather station. The metal building contained 2 diesel powered generators. There was no commercial power available in the town although all the buildings were wired for electricity. Apparently the mom & pop company went belly-up during the depression. 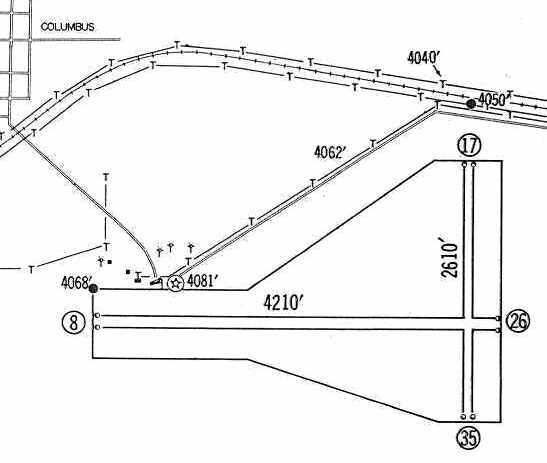 depicted Columbus Airport as having a 4,210' Runway 8/26 & a 2,160' Runway 17/35. A few small buildings were depicted on the northwest side of the field. 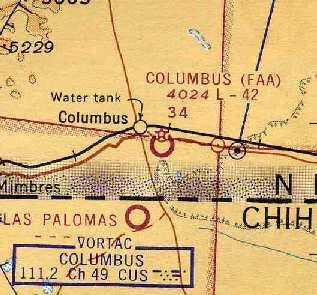 depicted the "Columbus (FAA)" airport as having a 4,200' unpaved runway. 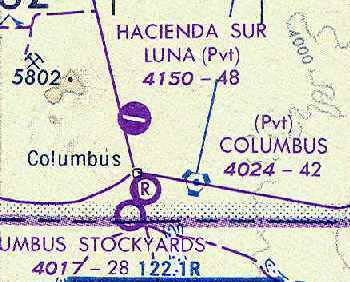 The 1965 USGS topo map depicted the outline of the airport, simply labeled as a "Landing Area". 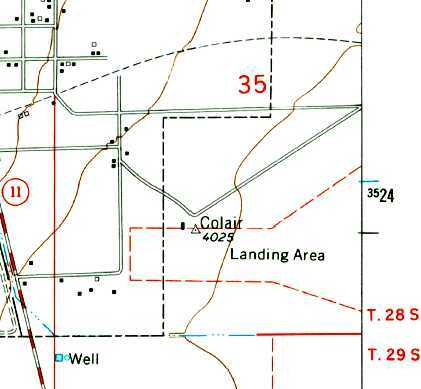 A surveying marker named "Colair" was depicted at the location of the former airport beacon. In 1965 it was transitioned over to the City of Columbus & it became Columbus Municipal Airport (according to David Brooks). as that is how it was depicted on the July 1976 CG-19 World Aeronautical Chart (courtesy of Chris Kennedy). described Columbus Municipal as having a single 4,210' gravel Runway 8/26. now simply labeled as a "Landing Area". was on the 1994 CG-19 World Aeronautical Chart (according to David Brooks). 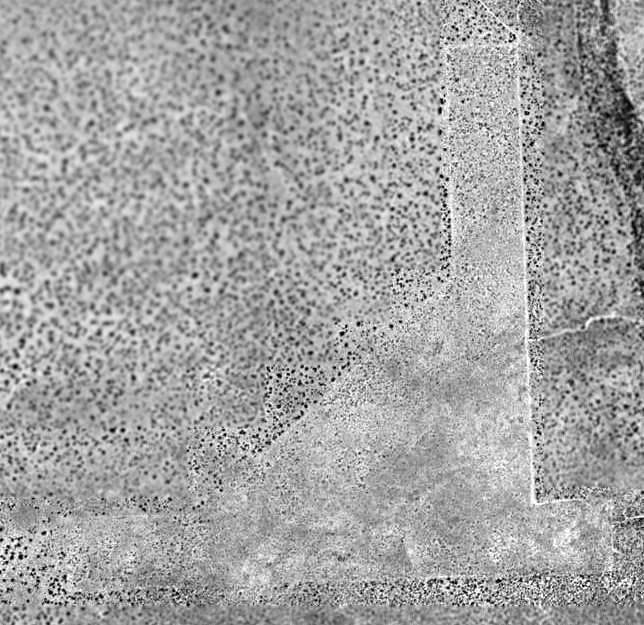 The distinctive outline of the Columbus Airport was still very much apparent in a 1996 USGS aerial view looking north. It does not appear as if any buildings or the beacon tower remain standing, though. as it was no longer depicted at all on the 1998 World Aeronautical Chart. because they were being used by drug smugglers. A 2005 photo by Clifford Bossie of a light cone & boundary markers at the site of Columbus Airport. 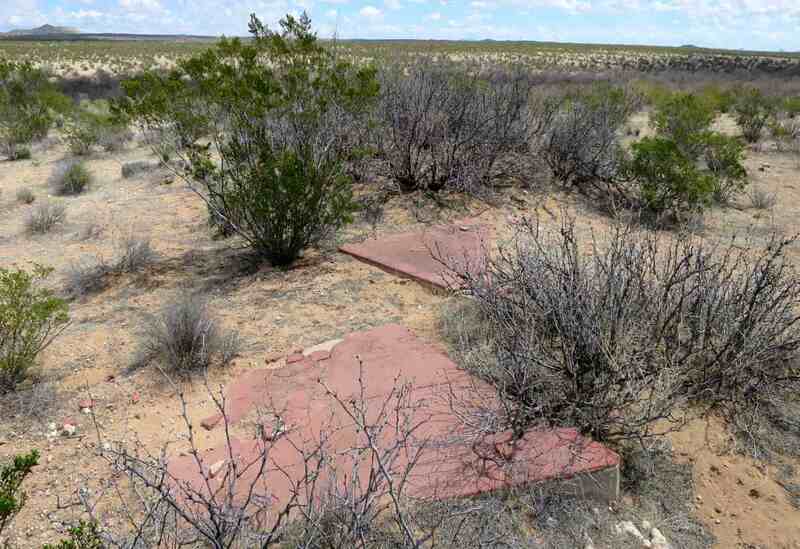 Clifford reported, “Coming in from the East I could see a boundary (or perimeter) light cone & marker from NM Highway 9.
so I turned onto that & drove down to the NE corner of the field. 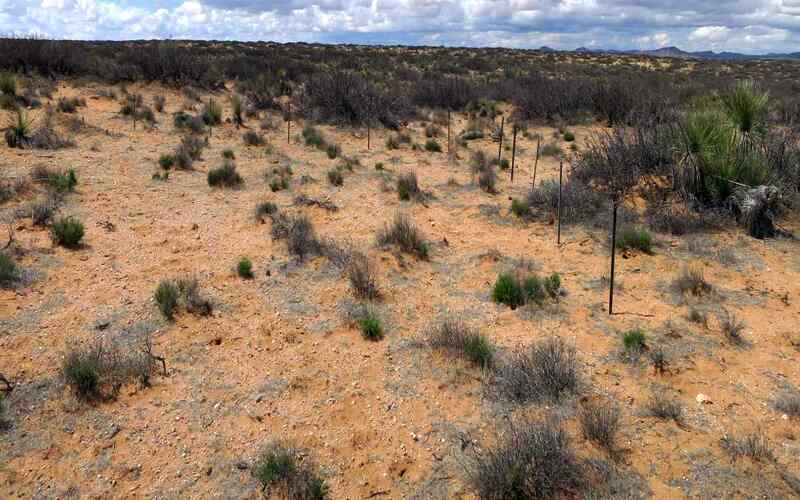 but the field itself is pretty well overgrown with mesquite, sage & other vegetation. I seriously doubt that it was active as recently as 1994. A 2005 photo by Clifford Bossie of what appears to be the foundation of the former terminal building. Clifford noted, “Following that road to the West I came to the location of where the airport buildings had been located. and the generator might have been for emergency use). A 2005 photo by Clifford Bossie of the former airmail route directional arrow. both being red & the arrow had a survey marker embedded into it. which was relocated at some point to the nearby Columbus Historical Society Museum. met to discuss what might be done to protect the site of the original landing field & flight line where the First Aero Squadron was based in 1916/17. While the site is listed on the National Register of Historic Places, it was threatened by ever expanding residential & commercial development. 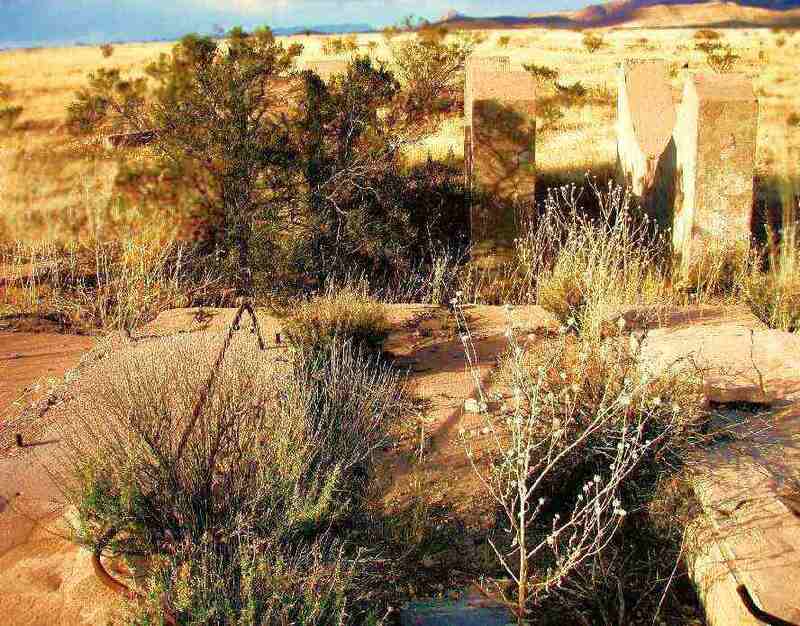 It was even listed as one of most endangered historic sites in NM. By 2008 the group had formed the First Aero Squadron Foundation (FASF) with the mission of securing, preserving & restoring the historic Aerodrome. In 2009, the FASF purchased 60 acres of the historic site, comprising part of the original 1916 Aerodrome as well as the old Columbus Municipal Airport, itself steeped in history. Thanks to the dedication of the Board & our Friends, we own this land free & clear. 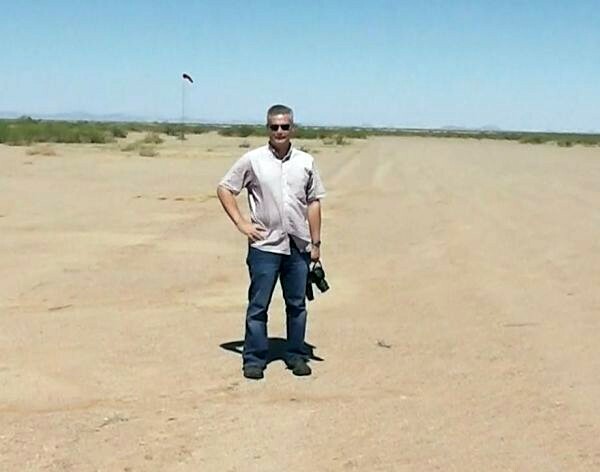 A June 2013 photo of 1st Aero Squadron Lt. Col.Chi Chi Rodriguez (courtesy of Ric Lambart), looking west along the Columbus runway with the windsock in background. Ric Lambart observed, “The photo was taken in the year of the 1st Aero Squadron's Centennial birthday. which we are now engaged in paying off – and we are already, thanks to our 'Buy an Acre' campaign, more than half-way there. With both parcels under FASF control, the entire original landmarked historic site is now protected. We are no longer on anyone’s endangered list! who pioneered the beginnings of American air power – and its lead in world civil aviation development. We will reconstruct the original 1916 Aerodrome & build a museum to house a representative selection of early World War I & pre-World War II aircraft. The distinctive outline of the Columbus Airport was still very much apparent in a 2016 aerial view looking north. 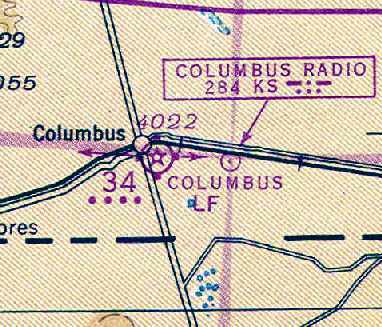 The site of Columbus Airport is located southeast of the intersection of Route 9 & Kansas Street. 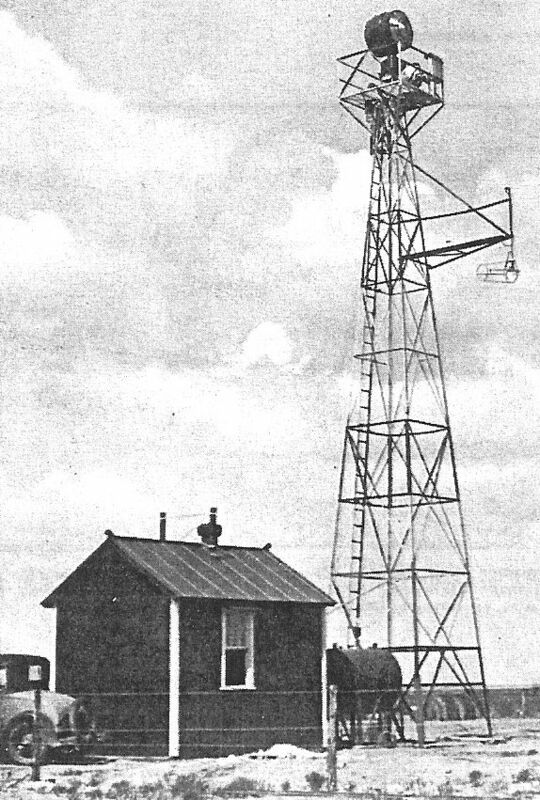 An undated photo of an airway beacon (believed to be Mount Riley) from a May 1932 Kohler Generator newsletter (courtesy of Steve Owen). for the emergency use of commercial aircraft. The date of construction of the Mount Riley airfield has not been determined. was an undated photo (believed to be Mount Riley) from a May 1932 Kohler Generator newsletter (courtesy of Steve Owen). 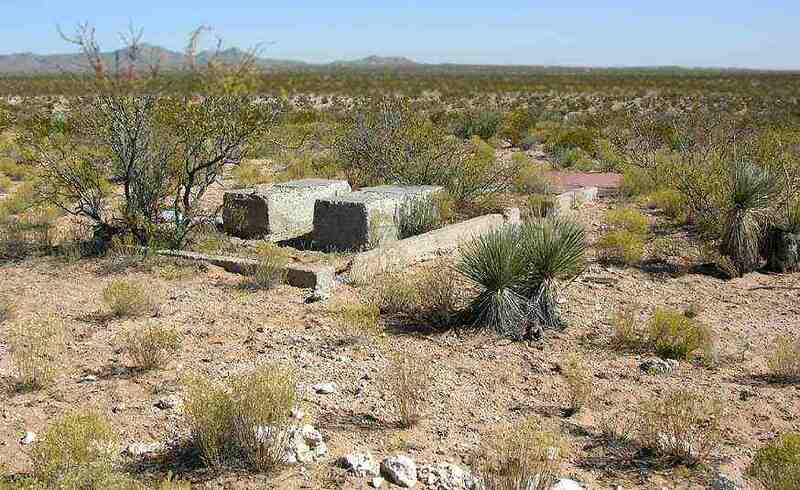 which described Mount Riley as Site 68 along the San Diego - El Paso airway. It was said to have three sod runways in an "L" shape, with the longest being the 3,600' east/west strip. listed Mount Riley as Site 37 along the Phoenix - El Paso airway. 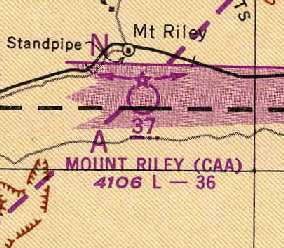 "Mount Riley (CAA)" was still depicted as an active airfield on the 1949 El Paso Sectional Chart (courtesy of Chris Kennedy). 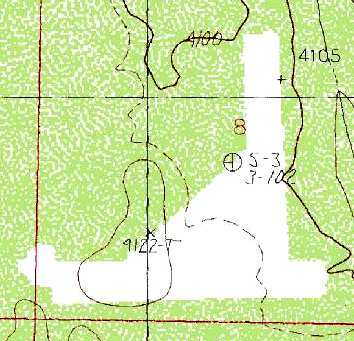 The airfield was not depicted at all on the 1951 USGS topo map. as it was not listed in the 1962 AOPA Airport Directory. The airfield was not depicted at all on USGS topo maps from 1974 or 1981. 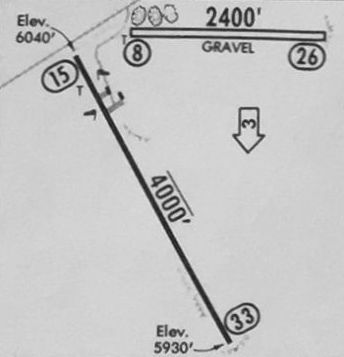 However, the cleared area of the airfield was depicted (although not labeled) on the 1985 USGS topo map. and that is the case with Mount Riley. as the land within the former airfield remains noticeably more clear of scrub than the surrounding property. There are no traces of any former buildings at the site. by looking at an aerial photograph of the area. 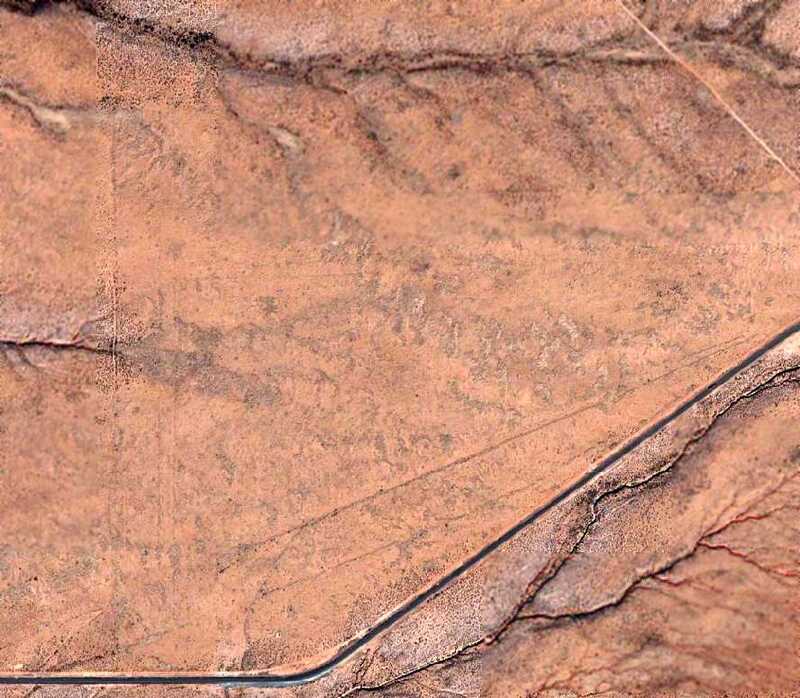 I noticed an unusual pattern in the desert that looked like an airstrip to me. I have been in this area many times before & never saw anything resembling an airfield. My curiosity got the best of me & I drove out to the site to look around. 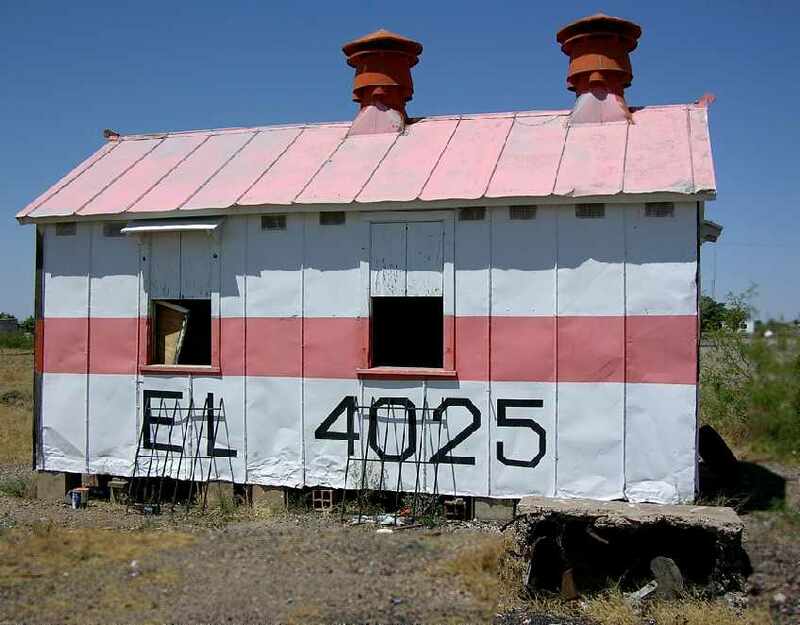 a ghost town along the abandoned El Paso & Southwestern Railroad. and no indication that anyone has traveled that road in many years. About 100 yards down the road I came to the northern point of the north/south runway & parked the truck." I found a concrete foundation painted red with angle iron set in the concrete & cut off at ground level. This used to be the base of a beacon tower. I also found several pieces of broken concrete, also painted red. Piecing these together, they form a huge arrow, once used to point out the direction of the air route. including what looked like a foundation to a generator house. Many tin oilcans, part to an old 4-cylinder engine & other rubbish were strewn around the surrounding desert." similar to a fence post were set in the ground. There were about 10 of these poles set about 20 feet apart. Another 100 yards down the runway was another series of these poles. This continued all the way around the perimeter of the airfield. In the surrounding desert around each of these series of poles I found several old light bulbs (25 watt Westinghouse). At the south end of the north/south runway I found several empty 55 gallon drums." Lloyd continued, "I also found the site of one of the navigation beacons used to mark this airway. It is on a hill about 10 miles west of the Mount Riley airstrip. The beacon is on top of a 50-foot hill. The foundation of the beacon tower is identical to the foundation I found at the Mount Riley airstrip. that apparently used to secure a gasoline motor & generator. In the side of the hill are several telephone poles were once used to carry the electrical wires to the tower. All sorts of rubble, broken light bulbs, fuse blocks, wires, etc. can be found at the top of the hill. 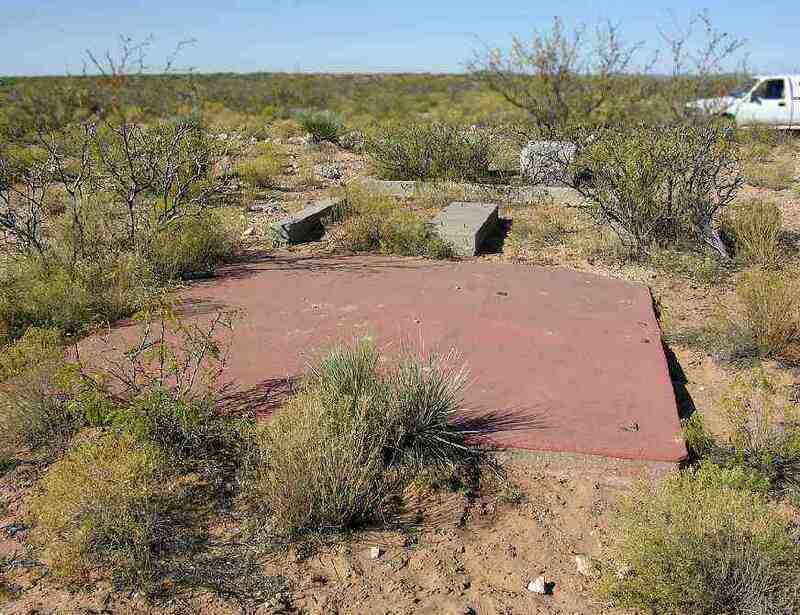 Portions of a concrete arrow are near the generator house at the bottom of the hill." Clifford Bossie visited the site of the Mt. Riley Airfield in 2005. 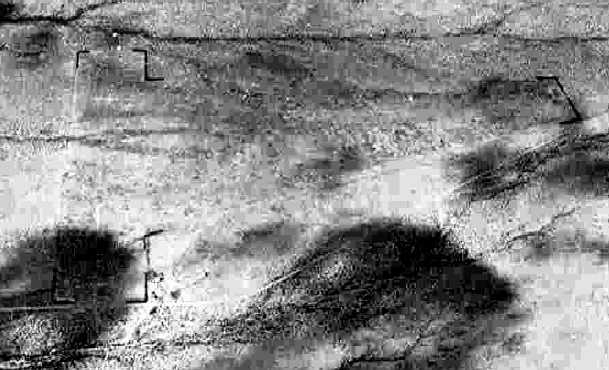 He reported: “From the air the outline is clear, but from the ground it is a lot harder to find. It appears that when the field was 'graded' the grading did little more than remove the vegetation. It is by no means flat. it would look pretty good to a pilot in distress. 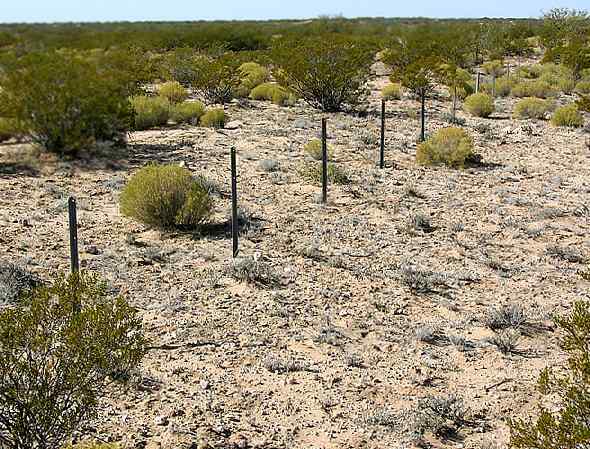 A 2005 photo by Clifford Bossie of the boundary posts at Mt. Riley. According to Clifford, “The posts that Mr. Sumner describes in his text were to hold the field boundary markers. It is possible that the light bulbs he mentions in his text were used to light those markers. I found no evidence of any field lighting. This was a very primitive field. A 2005 photo by Clifford Bossie of foundations at the site of the Mt. Riley Airfield. and in fact that was the first indication that I had managed to reach the right location. 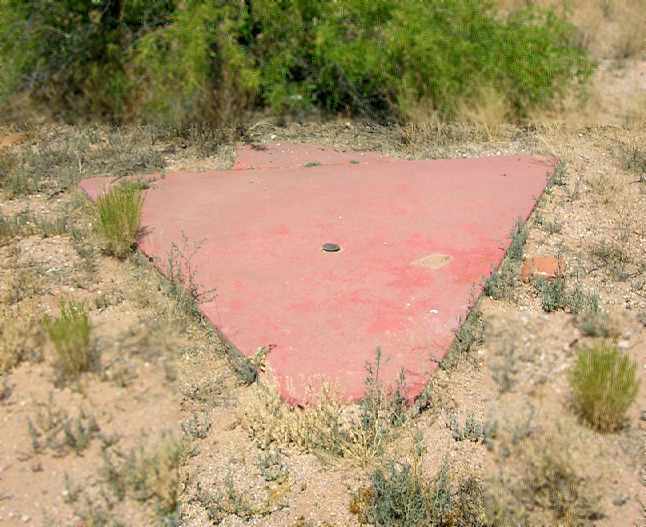 and the red concrete pad still has the cutoff legs for the beacon as Mr. Sumner describes. The red concrete is actually a thin layer of red colored (or dyed) concrete, not painted, layed on top of the beacon foundation. kind of like you used to see on Army bases around barracks. There are a couple of smaller boxes that I can only guess the purpose of. and about a mile South of NM Highway 9. I do not think the airfield was manned around the clock, if at all. There does not appear to have been any other structures than the area for the generator & beacon. or more likely that the railroad was contracted to maintain it. so I don't know how a pilot making an emergency landing could contact anyone afterwards. 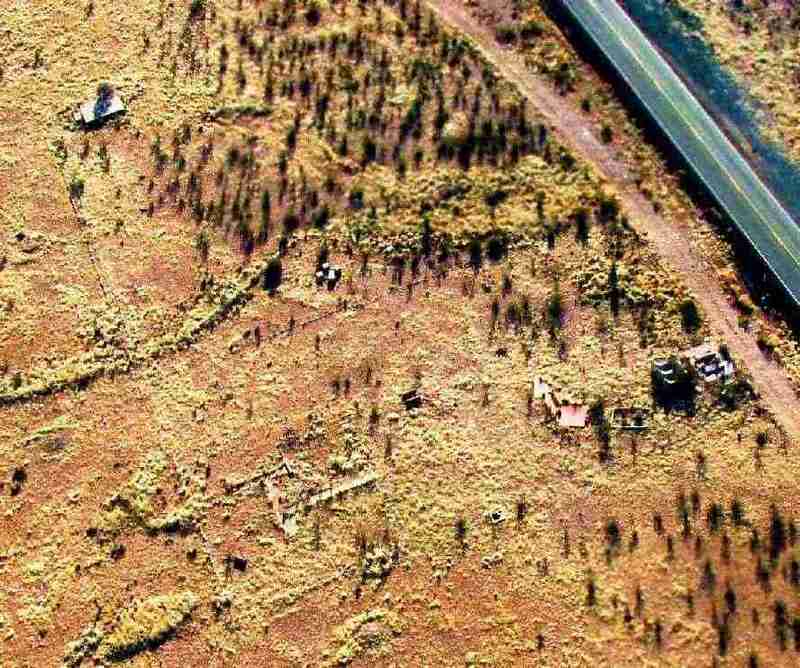 A 2006 aerial photo by Clifford Bossie looking southeast at the remains of the former runways at Mt. Riley. A 3/20/15 photo by Tony Rivera of the remains of the red concrete arrow at the site of the Mt. Riley Airfield. A 3/20/15 photo by Tony Rivera of the site of the Mt. Riley Airfield. 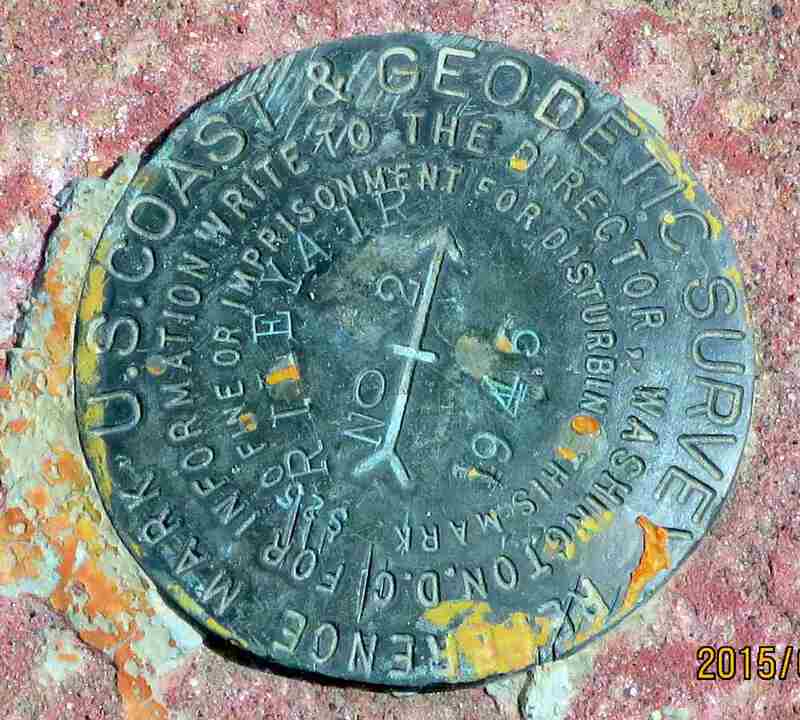 A 3/20/15 photo by Tony Rivera of a USGS survey monument at the site of the Mt. Riley Airfield. directly along the Mexican border. Thanks to Chris Kennedy for pointing out this field. 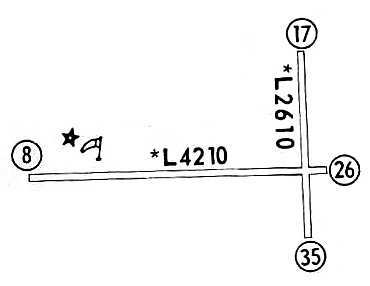 Deming Aux #1, as depicted on the February 1944 Roswell Sectional Chart (courtesy of Chris Kennedy). which served as a training field for bombardiers & a base for target towing aircraft. as it was not yet depicted on the August 1943 Roswell Sectional Chart (according to Chris Kennedy). was on the February 1944 Roswell Sectional Chart (courtesy of Chris Kennedy). Deming Aux #1 was still depicted as an auxiliary airfield on the 1945 Douglas Sectional Chart (courtesy of John Voss). as that is how it was depicted, labeled "Deming (South)", on the 1949 Phoenix Sectional Chart (courtesy of Chris Kennedy). It was described as having a 6,000' hard-surface runway. 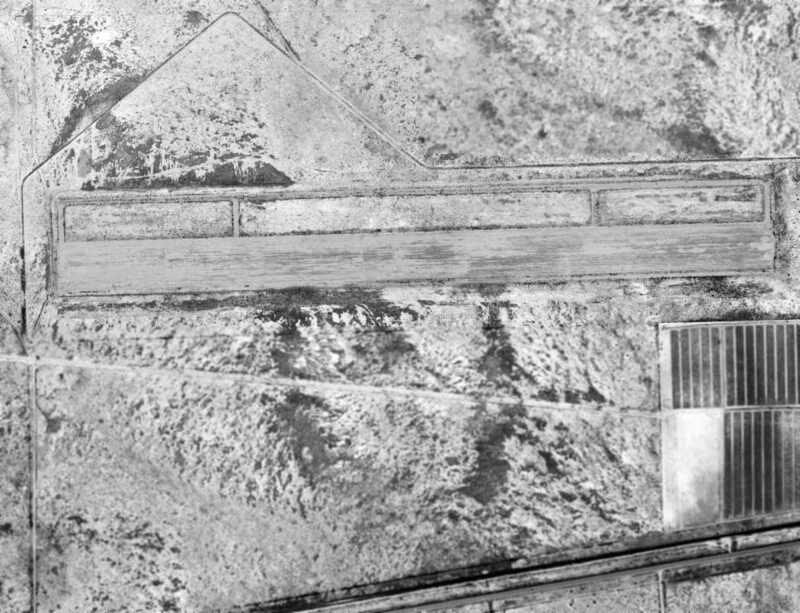 The earliest photo which has been located of the Deming Aux #1 Airfield was a 12/9/62 aerial photo. It depicted the airfield as consisting of a single east/west runway. There do not appear to be any traces of any buildings at the site. or more recent aeronautical charts. the airfield consists of a single 6,200' east/west runway. visible as the circular pad just east of the runway. The airspace over the aerostat is protected by a circular Restricted Area, R-5115. Deming Aux #2, as depicted on the February 1944 Roswell Sectional Chart (courtesy of Chris Kennedy). Deming Aux #2 was still depicted as an auxiliary airfield on the 1945 Douglas Sectional Chart (courtesy of John Voss). as that is how it was depicted, labeled "Deming (Center)", on the 1949 Phoenix Sectional Chart (courtesy of Chris Kennedy). as nothing at all was depicted at the location on the 1958 Phoenix Sectional Chart (courtesy of Chris Kennedy). 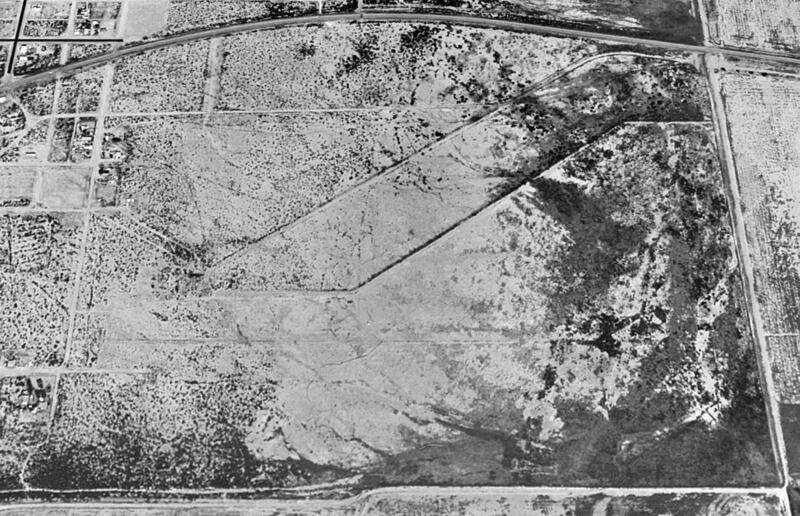 The earliest photo which has been located of the Deming Aux #2 airfield was a 1962 USGS aerial view. It depicted Deming Aux #2 as having a 5,800' east/west runway with a parallel taxiway on the north side. There did not appear to be any remnants of any buildings. 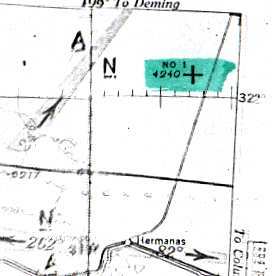 The Deming Aux #2 airfield was labeled "Abandoned airport" on the 1968 Phoenix Sectional Chart (courtesy of Chris Kennedy). It was simply labeled "Landing Strip" on the 1982 USGS topo map. 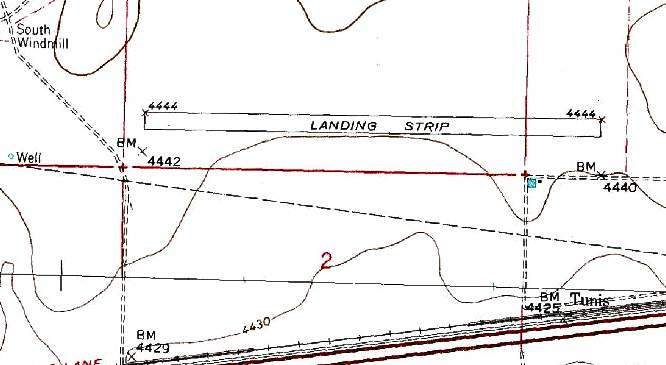 The 1991 USGS topo map depicted a single east/west runway, labeled simply as "Landing Strip". 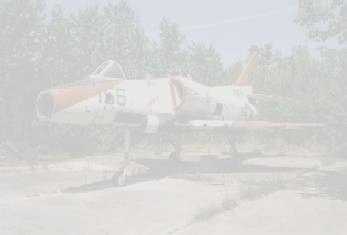 It was not depicted at all (even as an abandoned airfield) on aeronautical charts from 1998 or 2003. A 2003 photo looking southwest at Deming Aux #2 by Bill Suffa. "I was climbing at about 8,000 feet when I took this picture. I was climbing out of Deming, and picking up my IFR clearance as I spotted this field. It lies just north of I-10, and almost directly under V-94, west of the Deming VOR. It looks to have a lot of scrub on it, so I doubt it would be suitable for landing today." 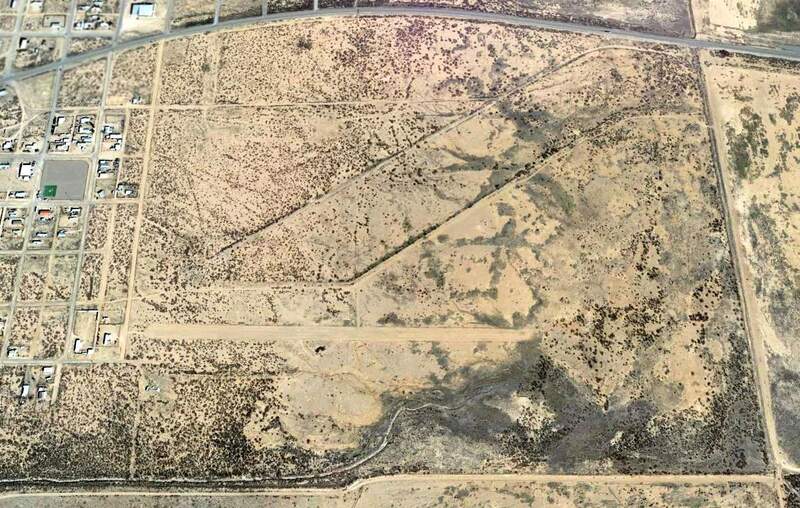 An 11/25/11 aerial view looking southeast shows the Deming Aux #2 airfield to remain intact though deteriorated. 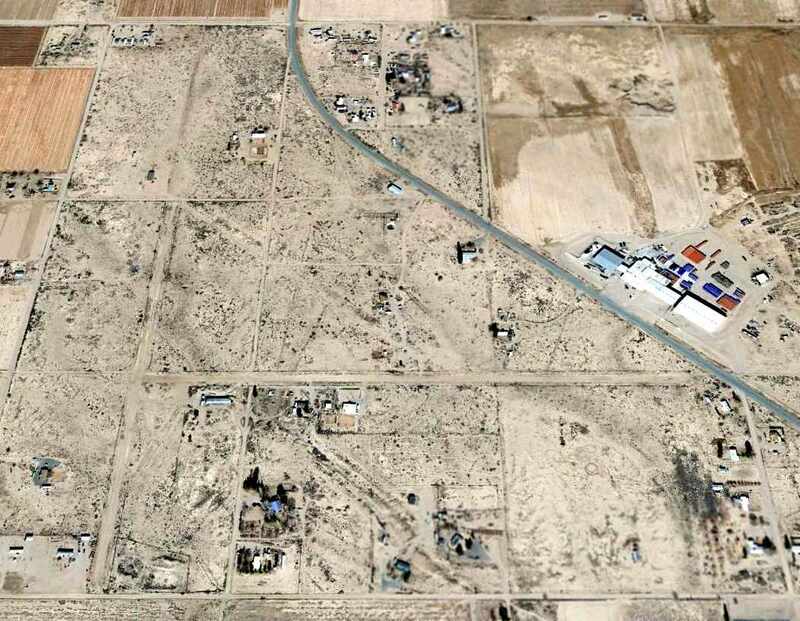 The Deming Aux #2 Airfield is located on the north side of Interstate 10, eight miles east of Gage.